The Drawing Center is the only fine arts institution in the U.S. to focus solely on the exhibition of drawings, both historical and contemporary. It was established in 1977 by curator Martha Beck (1938-2014) to provide opportunities for emerging and under-recognized artists; to demonstrate the significance and diversity of drawings throughout history; and to stimulate public dialogue on issues of art and culture. Located in SoHo, The Drawing Center’s galleries provide an intimate and human scale viewing experience. 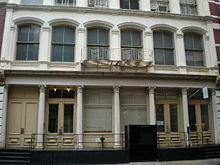 It has been called “one of the city’s most highly respected small art museums” by The New York Times. Attracting more than 55,000 visitors annually from the local area, across the country, and around the world, The Drawing Center has presented more than 230 exhibitions, published over 85 catalogs, and has been recognized through prestigious awards such as the International Art Critics Association/USA award for Best Show by a Non-Profit Gallery or Space for the 2010 exhibition Leon Golub: Live & Die Like a Lion?, the 2009 exhibitions Ree Morton: At the Still Point of the Turning World and Unica Zürn: Dark Spring and the 2008 exhibition, Frederick Kiesler: Co-Realities. Exhibitions have toured to prestigious museums around the world, including: Tate Britain, London, and the Museum of Contemporary Art, Sydney, Australia (The Stage of Drawing); the Museum of Contemporary Art, Barcelona, Spain (The Prinzhorn Collection); the Santa Monica Museum of Art (3 x Abstraction); Canadian Centre for Architecture, Montreal (Iannis Xenakis: Architect, Composer, Visionary); The Museum Het Domein, Sittard, Netherlands, and the Mary and Leigh Block Museum of Art, Northwestern University, Chicago (Leon Golub: Live + Die Like a Lion?). The Drawing Center’s acclaimed exhibitions encompass a wide range of artistic traditions and take a uniquely interdisciplinary approach. Dynamic exhibitions connect drawing to science (Ocean Flowers: Impressions from Nature), architecture (Constant, Inigo Jones, Louis Kahn, Yona Freidman, Frederick Kiesler), literature (Victor Hugo, Henri Michaux, Unica Zürn), political movements (Rikrit Tiravanija), theater (Picasso’s Parade, Theater on Paper), film (Sergei Eisenstein, Drawing on Film, Sun Xun), music (Iannis Xenakis, Musical Manuscripts), choreography (Trisha Brown), and technology (FAX). Historical Exhibitions focus on both acknowledged and under-recognized masters (such as Michelangelo, J.M.W. Turner, James Ensor, Marcel Duchamp, and Hilma af Klint) while Contemporary Exhibitions illuminate unexplored aspects of works by major present-day artists (such as Richard Serra, Louise Bourgeois, Ellsworth Kelly, Ellen Gallagher, Richard Tuttle, Alan Saret, Matt Mullican, Ree Morton, Leon Golub, and Walter De Maria), and Selectionsexhibitions present innovative work of emerging artists who are contributing to new interpretations of drawing. In the Drawing Room, which was opened across the street from the main gallery in 1997, emerging and under-recognized artists are encouraged to create experimental, cross-disciplinary work and site-specific installations. Examples of artists whose work was first introduced to a wide public at The Drawing Center are: Terry Winters, Glenn Ligon, Janine Antoni, William Kentridge, Kara Walker, Shahzia Sikander, and Julie Mehretu. The Drawing Center’s Viewing Program has encouraged the development of thousands of emerging artists through one-on-one portfolio reviews with a curator, and through its curated online Artist Registry of over 1,500 emerging artists. The Edward Hallam Tuck Publication Program provides new scholarship and critical context on contemporary and historical drawings through its scholarly catalogs for major exhibitions and its inventive Drawing Papers publication series, which accompanies each exhibition. Working in collaboration with renowned contemporary artists, The Drawing Center also publishes exclusive Limited Editions. A lively array of Public Programs — including gallery talks, panel discussions, concerts, family art workshops, and literary programs — engage audiences more deeply with the work on display. The Drawing Center’s Michael Iovenko School Programs, offered free of charge, has served 75,000 local public school students through drawing activities and discussions inspired by the approaches of the exhibiting artists. In addition, the Internship Program has introduced hundreds of college students to the workings of an active, cutting-edge museum. N Q R J Z 6 --If you are traveling on one of these lines, take the subway to the Canal Street station in SoHo. Walk west to Wooster Street and turn right. Walk one and a half blocks to The Drawing Center. A C E 1 -- If you are traveling on one of these lines, take the subway to the Canal Street station. Walk east to Wooster Street and turn left. Walk one and a half blocks to The Drawing Center. If you are traveling by car, you can take the Holland Tunnel, the West Side Highway, the Williamsburg Bridge, the Manhattan Bridge, or the FDR Drive. Exit south of Canal Street, on Hudson Street in SoHo. Continue north to Canal Street. Turn right onto Canal Street, then turn left onto Greene Street. Continue for two blocks to Broome Street and turn left onto Broome Street. Then, turn left onto Wooster Street. Continue for a half block to The Drawing Center. Exit onto Canal Street. Turn left onto Greene Street in SoHo. Continue for two blocks to Broome Street and turn left onto Broome Street. Then, turn left onto Wooster Street. Continue for a half block to The Drawing Center. Exit onto Delancey Street. Continue as Delancey Street becomes Kenmare Street, which ends at Lafayette Street. Turn left onto Lafayette Street and then make a quick right onto Broome Street. Turn left onto Wooster Street. Continue for a half block to The Drawing Center. Exit onto Canal Street, heading west. Turn right onto Greene Street. Continue for two blocks to Broome Street and turn left onto Broome Street. Then, turn left onto Wooster Street. Continue for a half block to The Drawing Center. Exit onto Houston Street, heading west towards SoHo. Turn left onto Wooster Street. Continue several blocks to The Drawing Center.